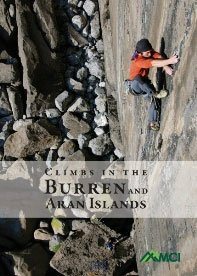 Here it is the long awaited Climbs in the Burren and Aran Islands. An excellent guide, well illustrated and excellently laid out. Certainly one of the new generation climbing guides. The book was bought as a birthday present for our son. It was delivered very quickly and he has already used it to choose a climb. We are all very happy with the service we got. Even if you never used it as a guide it's good to look at and get you psyched for the next trip! Hopefully the next generation of Irish guidebooks will be this good.